Let’s be honest: croutons really elevate a salad. Those crunchy little cubes of bread are just satisfying. But I have a conundrum surrounding croutons. 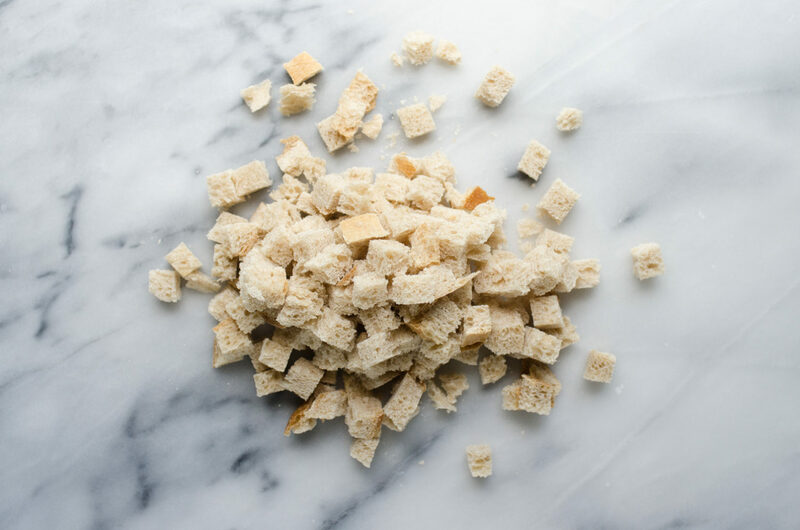 First, most store-bought croutons are full of junk: icky oils and flavorings and chemicals. Second, I don’t want to heat up my oven in the summer to make my own croutons. So of course I devised a method of toasting croutons over the stove. It’s really easy – let me show you how! NOTE: Some links are affiliate. All opinions are my own, of course! Thank you for supporting Buttered Side Up! 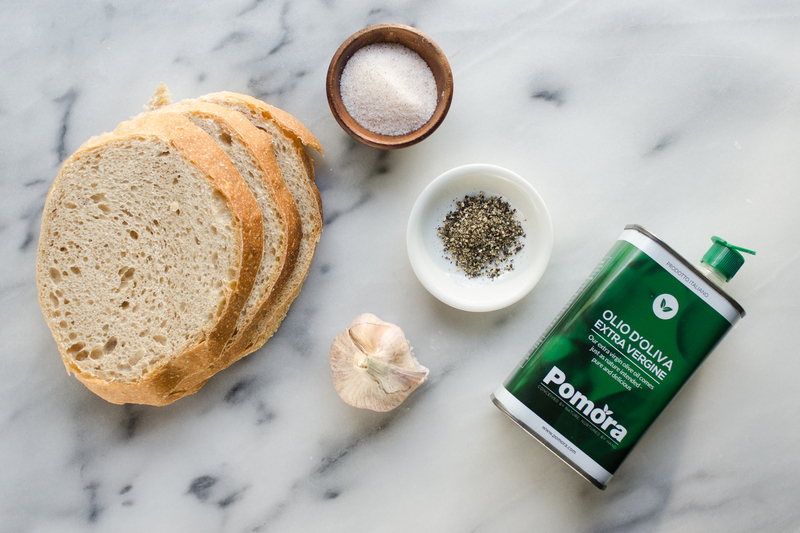 You only need 5 simple ingredients: bread, garlic, olive oil, salt, and pepper. Start by slicing the bread into cubes. 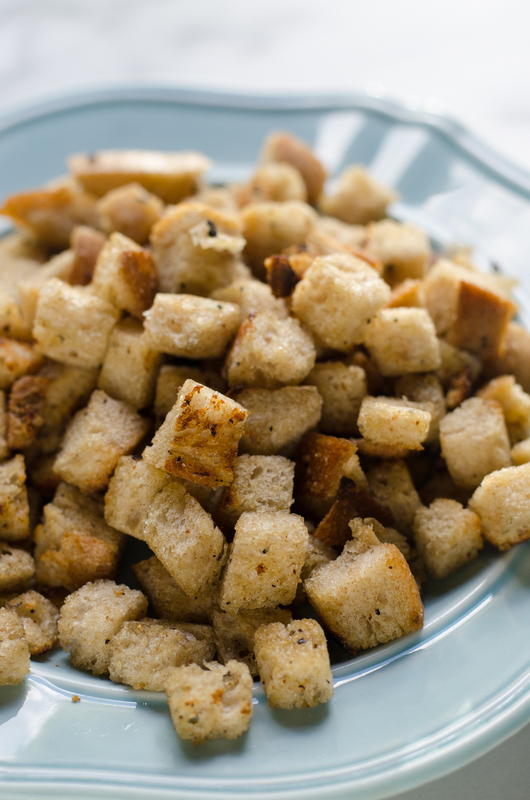 The smaller the cubes, the crustier the croutons will get. Put the bread cubes in a bowl and drizzle in the olive oil and salt and pepper. Toss to coat evenly. This time I was feeling lazy and just threw the garlic in with the other ingredients. I recommend waiting to add the garlic until later on in the cooking process because it can get bitter if you cook it too long. Heat a dry cast iron skillet over medium-low heat. Add the bread cubes and cook, stirring often, until the cubes are golden brown. Remove to a plate and allow to cool. 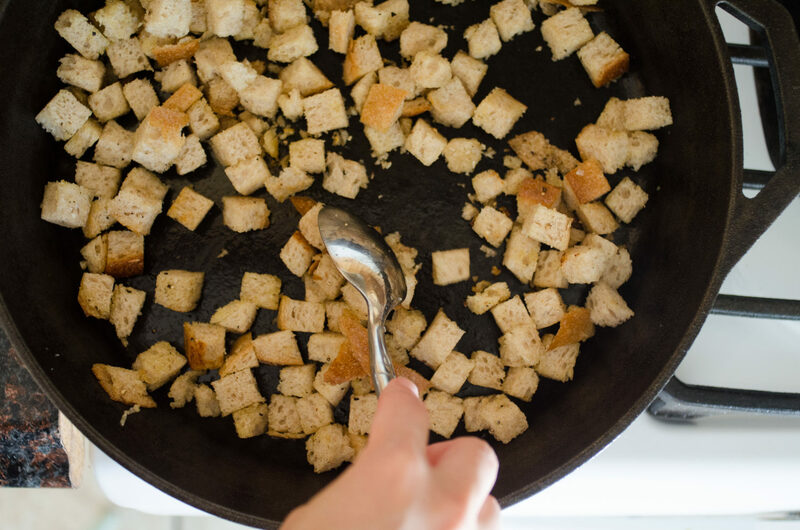 The croutons will crisp up as they cool. Just so you know: these are quite addictive. Once you start munching, there’s no going baaaaack! I used sourdough for these croutons, which is lovely. But keep in mind that whole grain or sourdough tends to not get as crispy as a straight-up white sandwich or crusty French loaf. 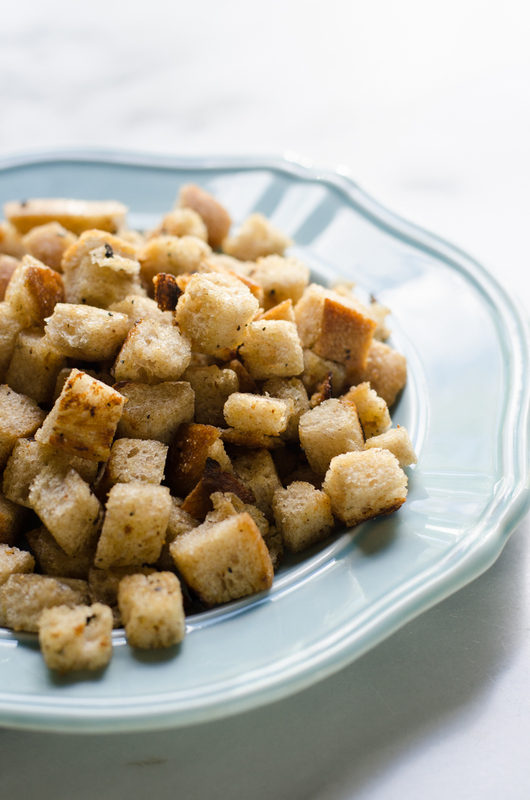 I like my croutons kind of soft in the middle, but if you like them crispy all the way through you might want to try a white bread. PS: Make sure to check out my other salad recipes! 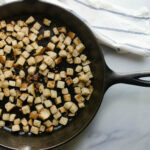 Croutons are so quick and easy to make in a cast iron skillet! 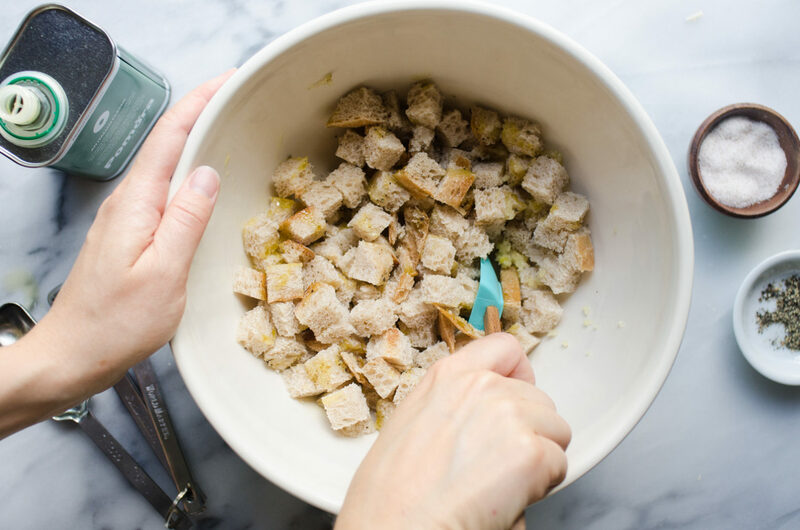 In a large mixing bowl, toss together the bread cubes, olive oil, and salt and pepper. Make sure the bread is coated evenly. Heat a large, dry cast iron skillet over medium-low heat. Add the seasoned bread cubes and cook, stirring often, until they’re golden and toasty, about 10-15 minutes. A few minutes before the croutons are done toasting, add the garlic and cook until softened. Remove to a plate and allow to cool completely. 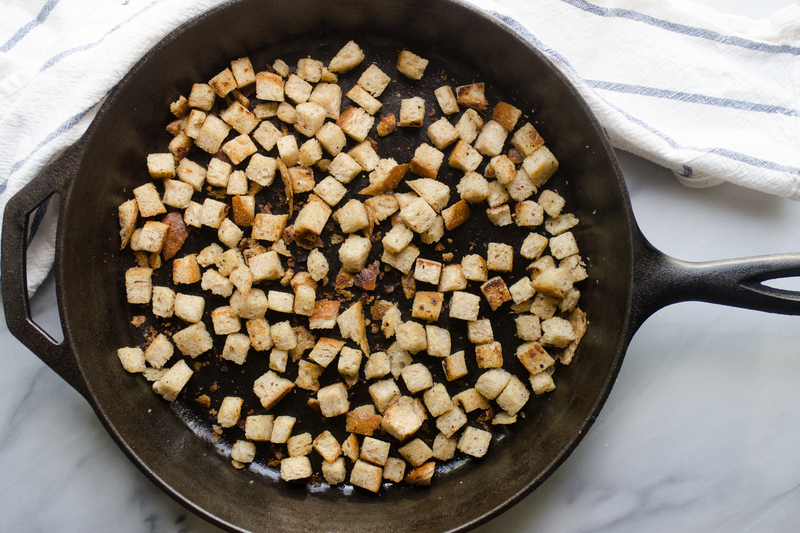 The croutons will crisp up as they cool.